Next he mixes in a copper pot this rice with various flavours such as ghee, milk, wheat, sour milk, and molasses. Near this pot he gets ready a piece of gold, a book, clods of earth, etc, as per the family’s custom, and having done the sipping and the sprinkling with pacifying water he should feed the child with the first solid food while reciting the two verses of the hymn “Propitious to thee be the rice and barley” (PS 16.4.8-9). “Propitious to thee be rice and barley, free from balAsa, causing no burning; these drive off the yakshama; these free from distress. What thou eatest, what thou drinkest, of grain, milk of the ploughing what should be eaten, what should not be eaten all food I make for thee poisonless.” (PS 16.4.8-9) Next, with the verse “Both to day and to night” (PS 16.4.10), having uttered “I commend you to day and night!”, he should feed the child the first bite for the sake of the day and night. This is the second feeding. “Both to day and to night, to them both we commit thee. Defend ye this man for me from the Arayas that seek to devour him .” (PS 16.4.10) Next, with the mantra “Unto autumn thee” (PS 16.5.2), having uttered “I commend you to the seasons!” he gives the child a bite. This is the third feeding. “Unto autumn, unto winter, unto spring, unto summer, we commit thee; [be] the rains pleasant to thee, in which the herbs grow.” (PS 16.5.2) Next, he should feed the child as per the latter’s capacity. Afterwards he should offer the child gold, etc. The thing that child grasps, that is his share, thus it is known. Next, he should perform the second part of the tantra, which is prescribed by the nakshatra kalpa , and the recitation of auspicious verses. Nevertheless people put only rice and barley in a copper pot and so on and with the hymn “Propitious to thee be the rice and barley” (PS 16.4.8-9) perform the first feeding. 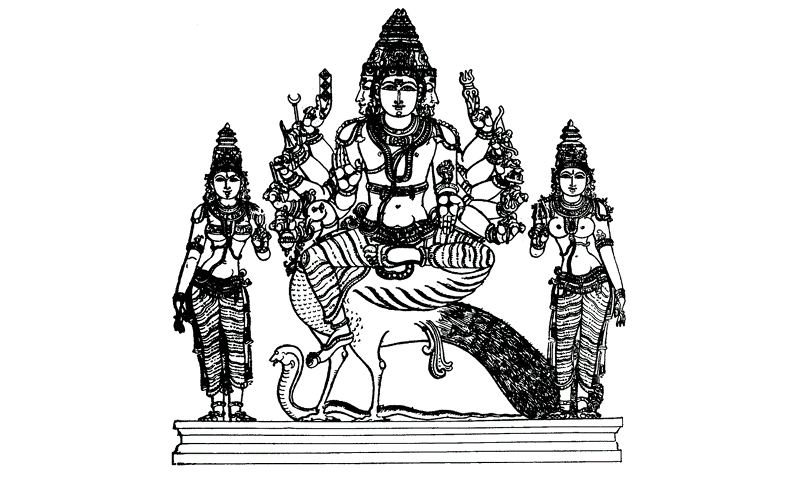 skanda yAga is a peculiar rite to atharvavedins with taittirIya parallels ( boudhAyan ,vaikhAnasa ) . This rite is probably earliest vedic trace of skanda dhUrta . The rite has to be performed thrice a year on the shashthI thithI ( sixth of shukla paksha) in the shukla paksha of phAlguna , AshADha and kArtika months. ( चतुर्षुचतुर्षु मासेषु फाल्गुणाषाढकार्त्तिकपूर्वपक्षेषु नित्यं कुर्वीत | DK 1.2).boudhAyan instead of shashthI thithI for all three months mentions of trayodashI in case of last two . On the day of the performance, performer should fast and go towards the east or north of his residence .At a suitable pure place he should erect a mandapa of 13 aratanI ( 13 cubit circumference ). The mandapa is decorated with tree leaves ( sarva vanaspatyAm ) garlands , bells , flags .In the center of mandapa ‘skanda dhUrtA’ is invited in a mirror ( probably image made up of glass ) with following mantras. Then a seat is offered with following mantra.
. Flowers should be offered while muttering the formula ‘इमा सुमानस ‘*+ प्रतिगृह्णातु भगवान् देवो धूर्त || .dhupa should be offered with following mantra. (RV-1.94.7) + प्रतिगृह्णातु भगवान् देवो धूर्त . Then different oudans , pAyasa , modaka and othere food stuff is offered to vallIpatI. 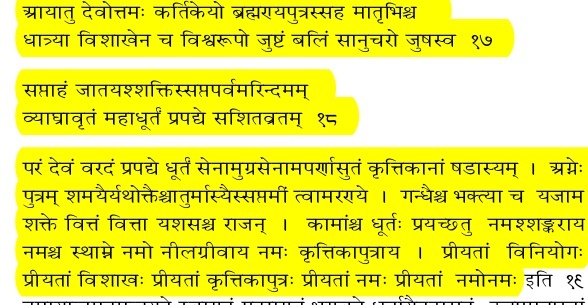 Now according to injunction of dhUrta kalpa , agnimukhaM is to be performed .Hence he should perform purva tantra . The oblations ( AhutIs ) are offered with six kAma suktAs ( भद्रम् इच्छन्तो, हिरण्यगर्भो, ममाग्ने वर्चस् ,त्वया मन्यो यस् ते मन्यो ,यद् देवा देवहेडनम् इति षट् ) and also with following mantras. Then he should perform uttara tantra . Thus practitioner of dhUrta kalpa preys to skanda dhUrta . Now other gifts are offered with six kAma suktAs and following mantra. The skanda murti ( archA vigraha ) should be circumbulated thrice and a ‘pratisara‘ ( amulet )is be tied on the hand with the two verses. Now the ceremony is to be closed with visarjana of skanda dhUrta .With following mantras the image of skanda is consigned in flowing water body. ( river / sea / spring ). When the nakshatras ( constellations/ stars )rises i.e. at the starting of night , the performer should enter house, see his wife and recite following presha mantra. It is stated that those who worship skandadhUrta get enjoyments, wealth, progeny and glory and attain immortality. Better to end with the following verse of khandar anubhutI. வானோ? புனல் பார் கனல் மாருதமோ? ஞானோ தயமோ? நவில் நான் மறையோ?